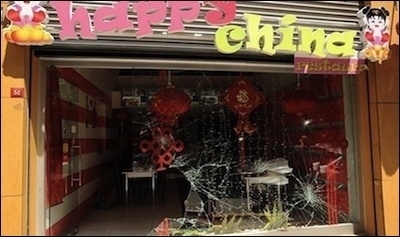 Istanbul's "Happy China" restaurant, after its window was smashed by an anti-Chinese mob. These days, it is quite dangerous for anyone with Far Eastern facial features to take a stroll on a Turkish street or to enjoy a plate of sushi. To angry Turks, every Far Easterner is a Chinese to attack. In protesting China's alleged ill treatment of Muslim Uighur Turks, angry Turkish Turks attacked a Chinese restaurant in Istanbul's Tophane district. Cihan Yavuz, the owner of the (no longer) "Happy China" restaurant, almost in tears, told reporters: "We are Turkish. Our cook is an Uighur Turk ... We do not even sell alcohol here ... It seems I will close down the restaurant and leave." In an even more painful incident, also in Istanbul, a group of nationalist Turks attacked a group of Korean tourists, mistaking them for Chinese. One can only cry at this primitive blend of ignorance and fanaticism. The staff at a popular Chinese restaurant in downtown Ankara mentioned they had requested police protection. On the morning of July 5, this otherwise-very-quiet neighbourhood in Ankara was noisy with chants from the same angry protesters. Unluckily, the Chinese Embassy is located just about a hundred yards away. 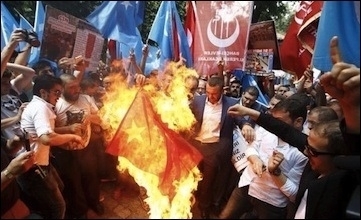 The protesters were waving Turkish and East Turkestan flags (identical except their colors: the Uighurs' flag features the same white crescent and star against a sky-blue background, as opposed to Turkey's red.) The group's entry into the street, where the embassy building is located, was blocked by the police. China accuses Turkey of giving militant Uighurs safe passage to wage jihad in Syria and Iraq. The group consisted of a strange assortment of Uighurs and nationalist and Islamist Turks, loudly vowing to take revenge on the "the red bastards of China." Occasionally, they would shout the cliché Islamist slogan "Allah-u Akbar" (in Arabic, "God is the greatest"). They asked the police to "surrender the consulate," probably so that they could lynch the personnel. By early evening, the protesting group had grown into a few thousand. Most of the roads in the neighbourhood were blocked or shut. The chanting of slogans, featuring a rich menu of ultra-nationalist, racist and Islamist genres, continued on until late in the evening before the crowd dispersed, luckily, without a serious incident. Turkey has witnessed numerous anti-Chinese protests since the beginning of the month. When the incidents of unrest erupted in China's Xinjiang province, where most Uighurs live -- and, reflecting their fight for independence, call the region "East Turkestan" -- an Islamist newspaper, Yeni Akit, ran the headline: "China, Israel's twin." The story claimed that this was "China's unnamed war against Islam and Muslims." It quoted Seyit Tumturk, vice president of the World Uighur Congress, as explaining what the problem was: "The Chinese organized a drinks festival in order to mock at Muslims' fasting [during Ramadan] and provoke them [into violence.]" In the Uighur man's thinking, non-Muslim Han Chinese should not consume alcohol because otherwise Muslim Uighurs would be provoked. And what happens when they are provoked? According to a Turkish magazine, Aktuel, the killings in Xinjiang province were sparked after a car tried to escape a police checkpoint. Chinese police officers who reportedly followed the car were fatally stabbed by the occupants of the vehicle. Backup police officers then came and began shooting suspects on sight. In the ensuing violence, 28 Uighurs were reportedly killed. ISIS 'caliph' Abu Bakr al-Baghdadi puts China at the top of his list of countries that violate Muslim rights. The problem is deeper than occasional unrest and violence, based on the Uighurs' more than six-decade-long fight for an independent homeland, which often includes terrorist methods. Chinese officials accuse Turkey of systematically allowing for a safe passage of militant Uighurs into the ranks of jihadist warriors in Syria and Iraq, and then letting them cross back into Turkey, where are secretly hosted and sent to China for terrorist activity there. "We suspect there are over 1,000 Uighurs subscribed into extremist groups [in Syria and Iraq]. They are potential security threats to China," one Chinese official said on condition of anonymity. China has legitimate concerns. The self-declared "caliph" of the Islamic State of Iraq and Syria (ISIS), Abu Bakr al-Baghdadi, in his declaration of the caliphate, put China at the top of his list of countries that violate Muslim rights. Al-Baghdadi also circulated on Twitter maps purporting to highlight ISIS's expansion plans, which included substantial parts of Xinjiang, China's largest province. Once again, nationalist and Islamist Turks are angry. But their government, compared to earlier anti-Israeli tirades over the Arab-Israeli dispute, is unusually quiet. In 2009, when similar incidents took place in Xinjiang, and around 100 Uighurs were killed in clashes, then-Prime Minister (now President), Recep Tayyip Erdogan, called their killing "an almost genocide." That angered China. In addition, the Turkish government called for a boycott of Chinese products. Then, as political relations between Turkey and China soured, geopolitical realities came into the picture. Erdogan et al forcefully grasped that China was too big to bite. Meanwhile, the Turkish boycott over Chinese products showed the level of seriousness when Turks threaten economically to hit a foreign country. Turkey's imports from China nearly doubled from $12.6 billion in 2009 to $24.9 billion in 2014. What is the Turkish word for hypocrisy? Turkey keeps on making new enemies -- in its region and far away. This is the result of bringing the popular sentiment on foreign matters into making public policy. The Turks feel both hostile to, and threatened by, most of the world -- not surprising in a country where the national dictum seems to be, "A Turk's only friend is a Turk." The latest Turkish-Chinese drama is merely another example showing how Turkey's desire to play the savior of all Muslims and Islamists in foreign lands is sometimes embarrassingly disproportionate to its power.